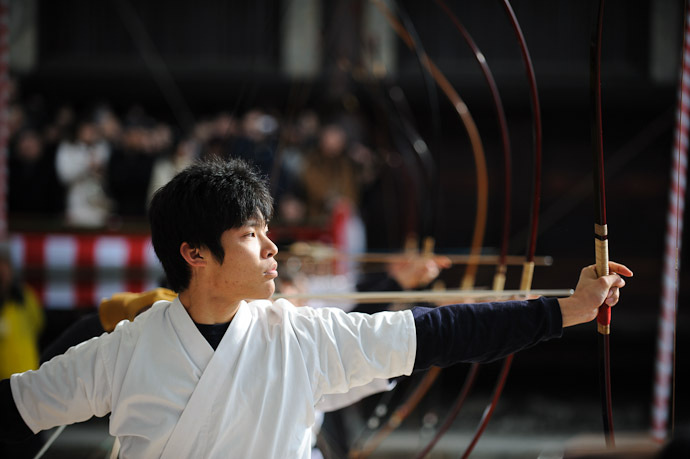 As I mentioned in yesterday's “Traditional Archery Like a Boss” post, I made my first visit to the annual tooshiya archery event (第62回 三十三間堂大的全国大会) at the Sanjusangendo Temple in Kyoto, a half-hour walk from my place. 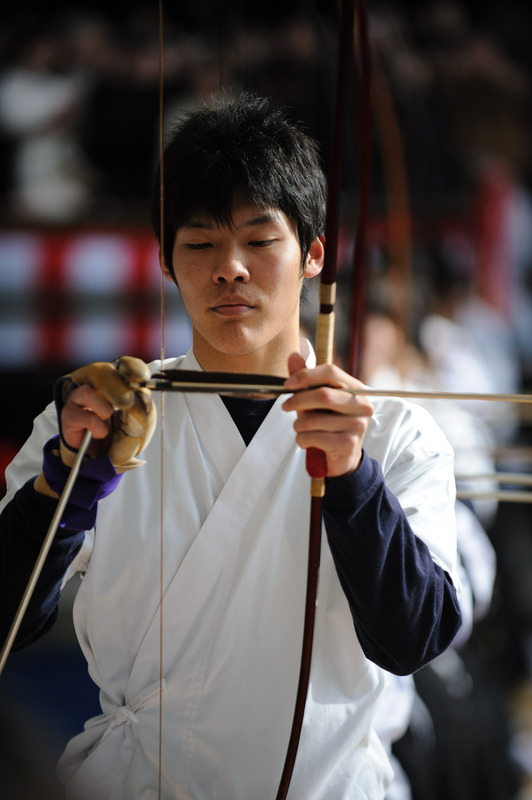 Japanese archery, kyuudou, is a discipline — neither purely sport nor art — comparable in one sense to karate or tea ceremony in that the result is not nearly as important as the perfection in the steps taken toward the result. Yesterday's event was my first introduction to it (the only other archery I've seen in Japan is the yabusame mounted archery event I witnessed a couple of years ago), but it was immediately apparent that the event was a big deal to those who participated. 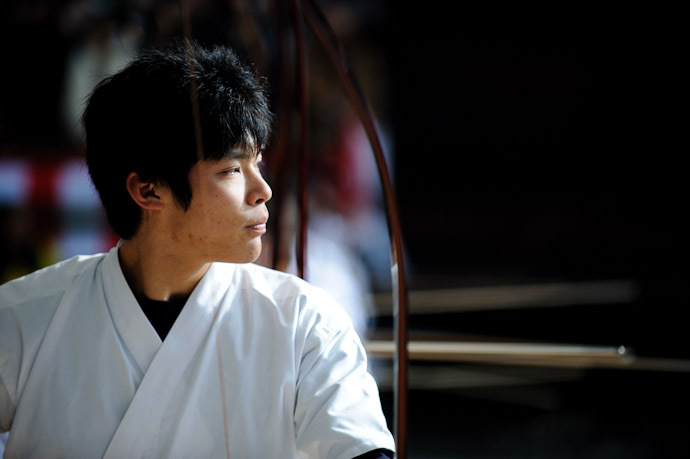 The age of adulthood in Japan is 20, and last week was the national holiday to celebrate those who became legal adults in the past year (as seen in my “Japan's Coming of Age Day Holiday Spectacle” post a while back). 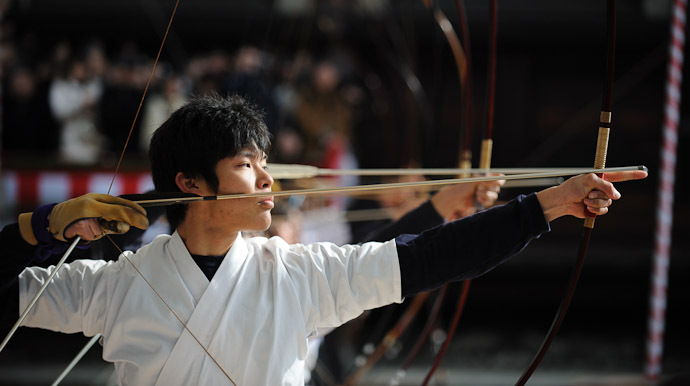 The rites of passage continued yesterday for the small slice of Japan's new adults who have achieved a high-enough rank in the practice of archery to have earned the privilege: they may shoot/perform two arrows outside the west veranda of the Sanjusangendo Temple. It's a very big deal. 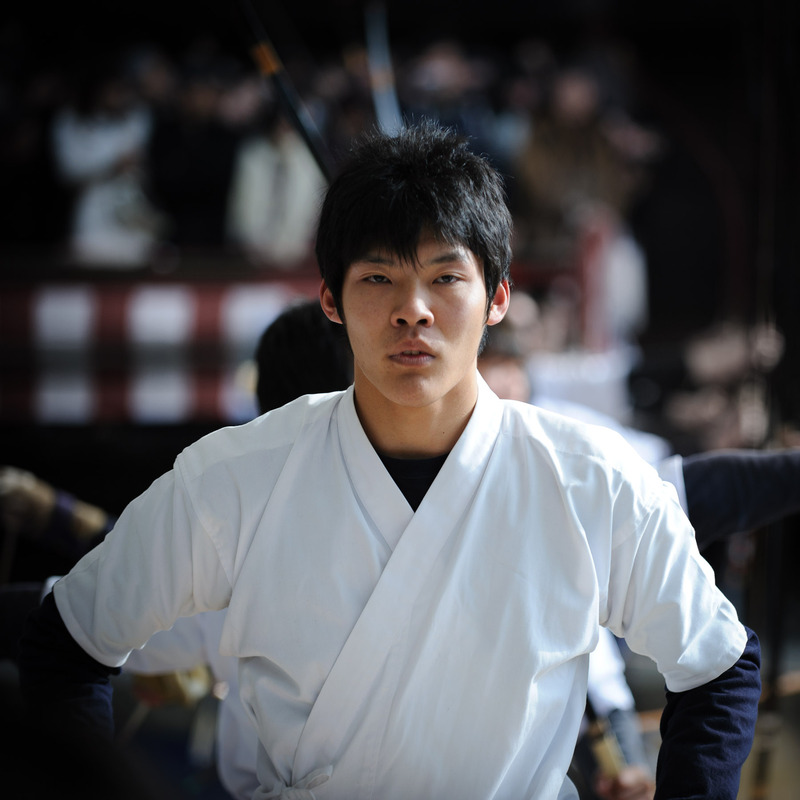 Yesterday, about 2,200 new adults from around Japan got the chance. 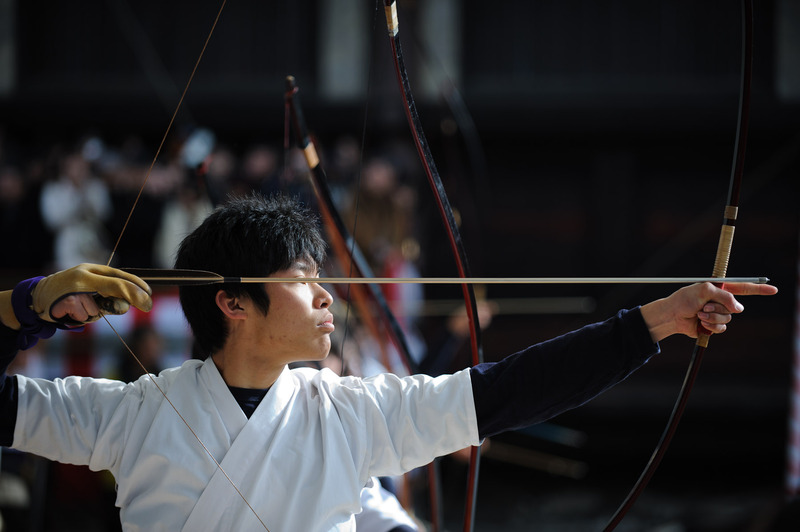 It was an absolute mad-house of an event, but for the short moment when an archer was on the shooting platform, nothing else existed for them but the bow, arrow, and target. 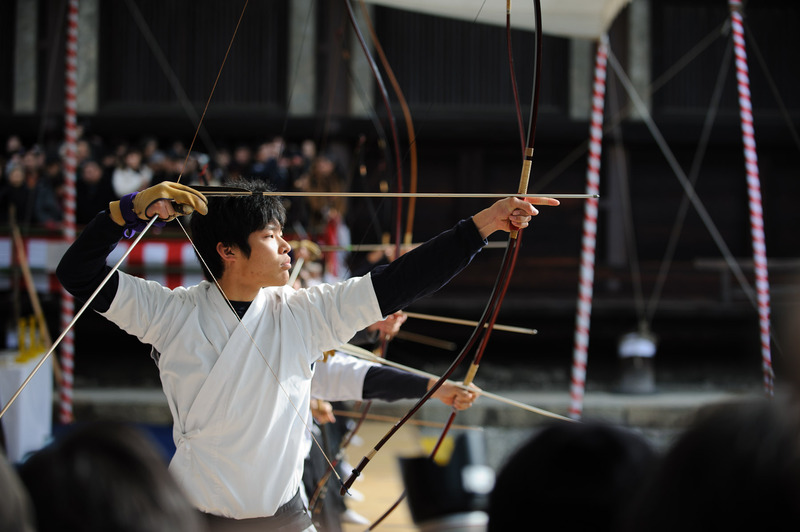 Twelve archers were in position and shooting at any one time, but the shooting platform was absolutely silent except for the twang of the string when an arrow was shot, and the very occasional clatter of a dropped bow. Slowly and carefully. This takes 15 seconds. 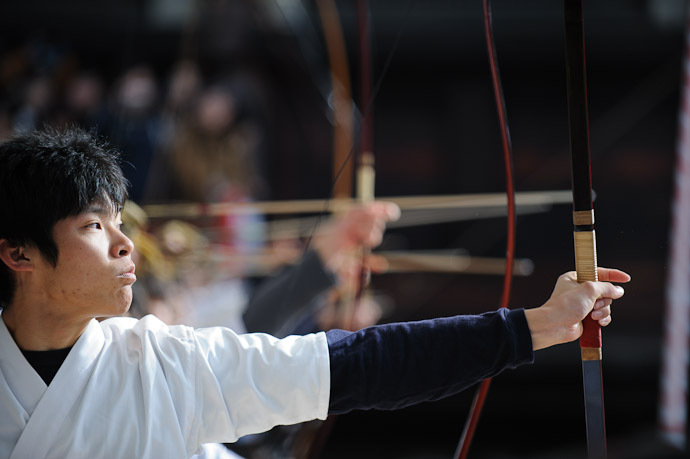 There is no movement of the archer when the arrow is released, except for the fingers doing the release and then that hand snapping straight back in recoil, leaving their arms spread wide. 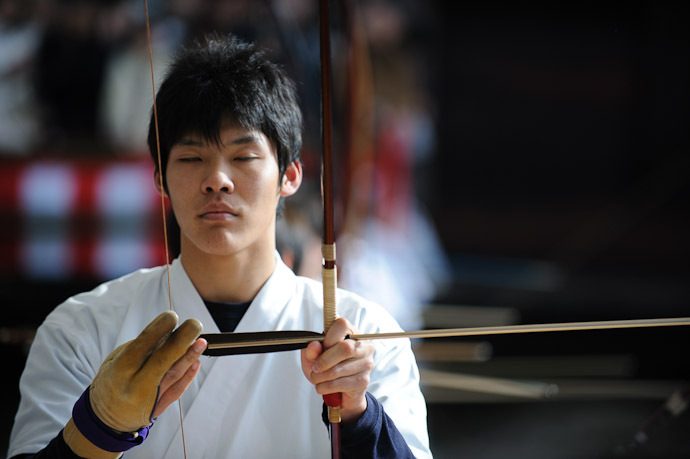 Their body, legs, other hand, head, and gaze remain utterly motionless, and there is no sound save the twang of the bow. The sight of the arrow in flight for 60m toward the 100cm target is breathtaking in a way I would not have imagined, nor can I explain. 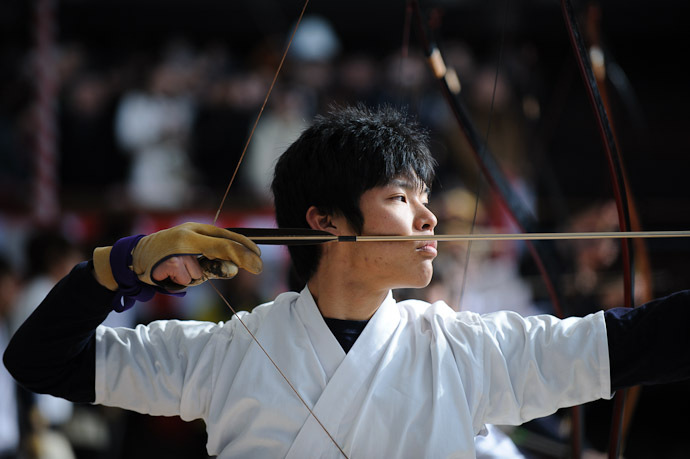 It's impossible to discern from his reaction whether he even came close, much less hit the target, because there is no reaction. At all. A couple of days before the event it was explained to me by the staff at my favorite Japanese restaurant that it's all in the execution and that it's irrelevant whether the target is hit, but that's not entirely accurate: after the 1,110+ men had gone, they announced the few dozen who had hit the target. 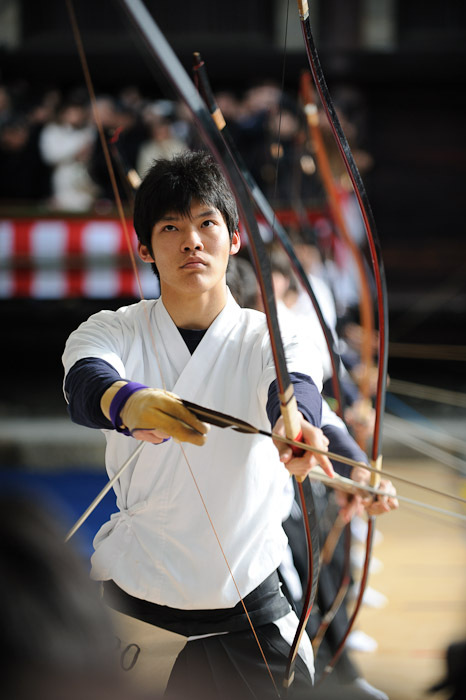 However, it's telling that announcement consisted of, for each archer, their shooting number (everyone had a number like in a marathon), their city and school, and the name of their instructor. Notably absent was the name of the archer himself. It's at this point that he looked straight at me, though it was obvious that he didn't even see me, and I got the shot that opens this post. I was part of a massive dozens-deep scrum of observers, many with step ladders and most all with cameras, but the archer was alone in his own world. It's hard to see, but in that last shot a light dust hangs where the arrow brushed against the bow on its way out. 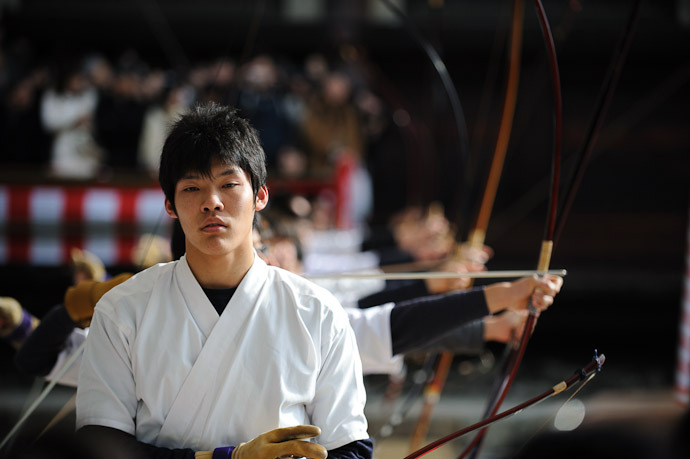 He again holds that pose for a good long while, then very slowly collects himself, bows, and steps back in his return to reality, making way for the next wave of archers. 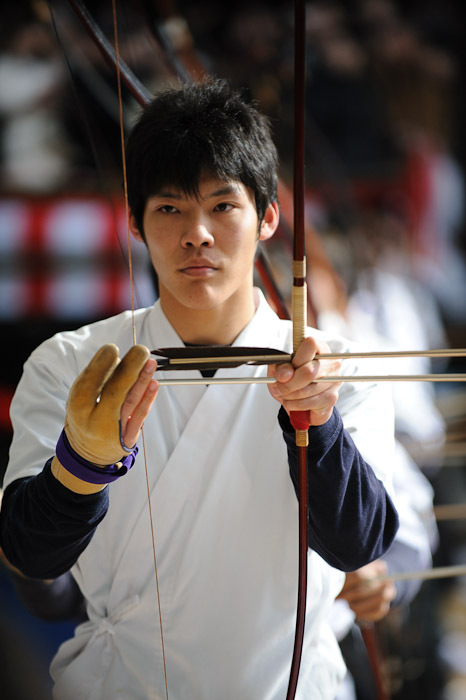 I have no idea whether he hit with either arrow. This was very cool to see and I greatly enjoyed your thoughts and explanations that went along with it. Thank you for sharing it. Wow! Great photos. 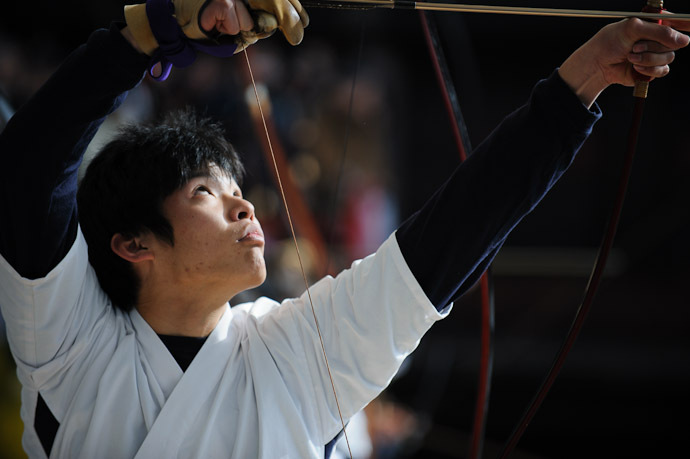 You captured the spirit of the event, and of its participants. How I wish this young archer (and his parents) could read your posting of his event. Thank you for beautiful photos (of the young man and yesterday’s older veteran) and a beautiful text. It describes the whole process so perfectly. I don’t remember the exact quote, but there’s one that talks about the harmony of the bow and the arrow… that the arrow, once released has no choice but to seek its target, and the bow without the arrow is but an empty promise of flight. Great images and explanations. Feeling the tradition into my bones! 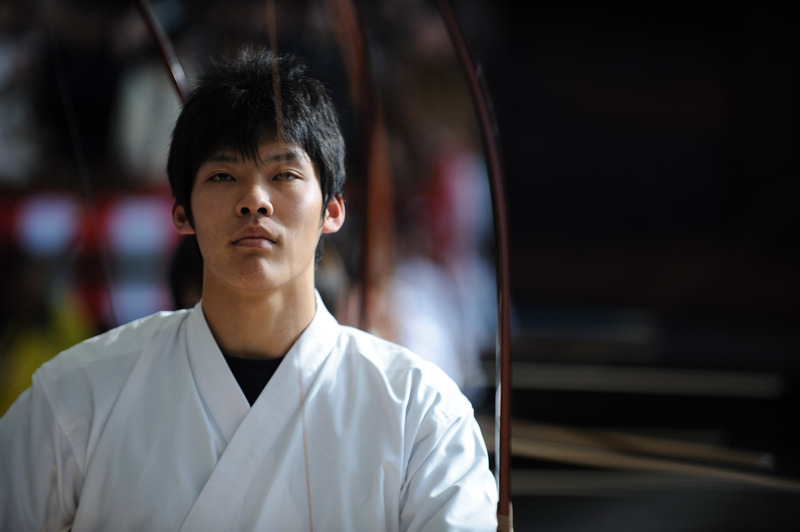 Promising myself to see this with my own eyes in Tokyo 2020. Thank you for sharing your passion with the rest of the world.